And by using them with downloadable content such as ebooks you can both increase the amount of leads you generate and begin to follow up with email autoresponders. 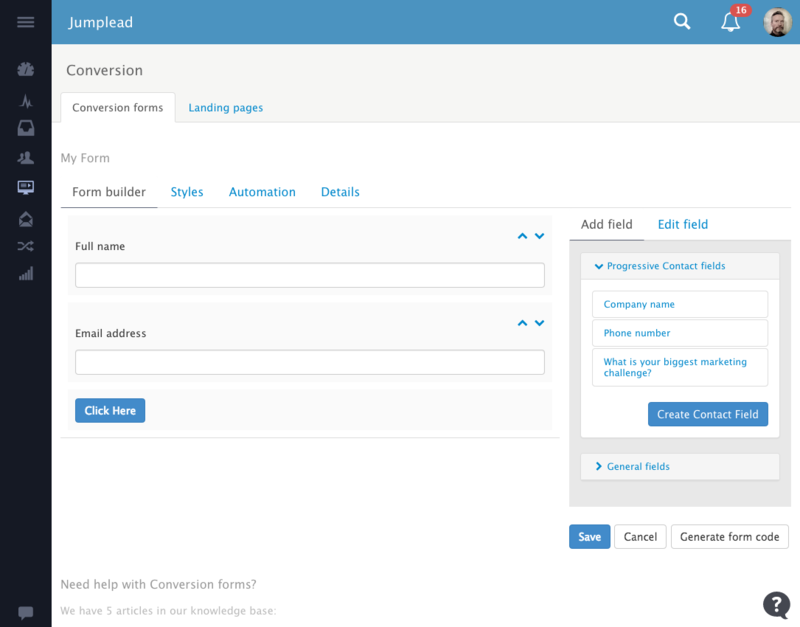 We report the overall conversion rate for your forms on the Dashboard, as well as a breakdown of your active forms in the Conversion section. So let's get started and add our first Conversion form, we'll need to give our Conversion form a name, and to specify the redirect address (this is usually a 'Thank you' page). I'm just creating a basic contact page, so I'm not adding any progressive profiling fields. I'll go into more depth with those another day. We are then taken to the Form Builder which has 'Full name' and 'Email address' as the basic set of required fields to create a contact. I'm going to add a basic text area for our leads to add a message, and change the name of our submit button as well. You can preview your form as well as add any CSS styles to tweak the look and layout of your form. It's important to remember to add an automation to your forms, so that when it's completed something actually happens other that the contact being created. The automation that I will add will be to send a notification, although you can start campaigns, stop campaigns, add contact tags, change stage etc. So I'll add that automation, then I'll pop back to the Form Builder page where I can generate my form code to add to my website. I'm going to use the Shortcode option because I'm going to add this to a WordPress website. I'll copy that onto my clipboard and flip back over to WordPress. Head for my contact page. And then it's really just a case of pasting that text from my clipboard into the body of the article. Then it actually works with the tracking code to render the correct form elements. That's useful when you get into progressive profiling and more complex forms, because we can show the specific fields that are relevant for each contact. So different people will actually see different form fields depending upon what we already know about them. If we flip over to the website you can see the form we have just created. Now I'll complete that form on the website and show you what happens in Jumplead when someone actually completes a form. I'll add my name and email address then pop a message in and submit it. So, that will have created the contact in Jumplead and also hook up any analytics information that exists already. Back over to Jumplead and into the Activity section, and there I am, it's created me as a contact and tracked my activity. If I click through to the Profile page of the contact you can see we've pulled in the social media profiles that relate to the contact, and the activity history has been pulled together. You can now start adding notes and tasks and start working with that contact. 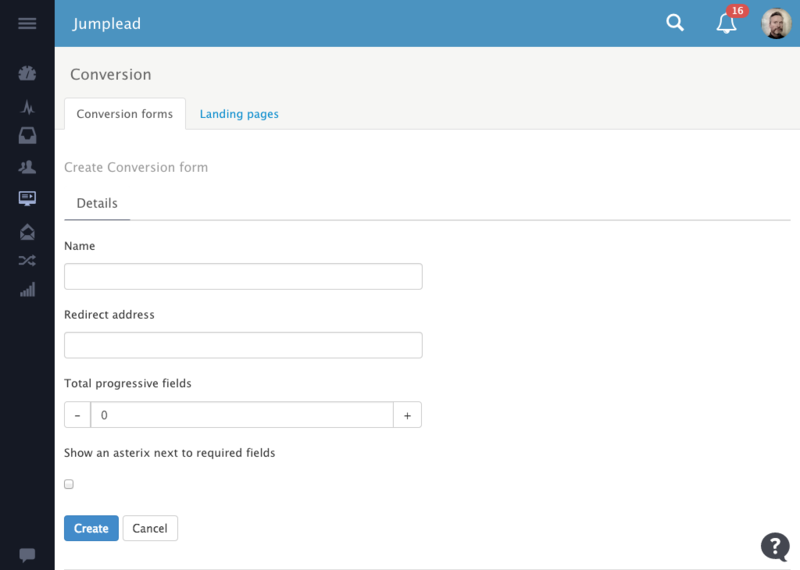 If we go over to the main conversion page, you'll see that the form exists and we are tracking the statistics. So you can see which are effective, which aren't and begin working on improving them. Back to the Dashboard and there we are! 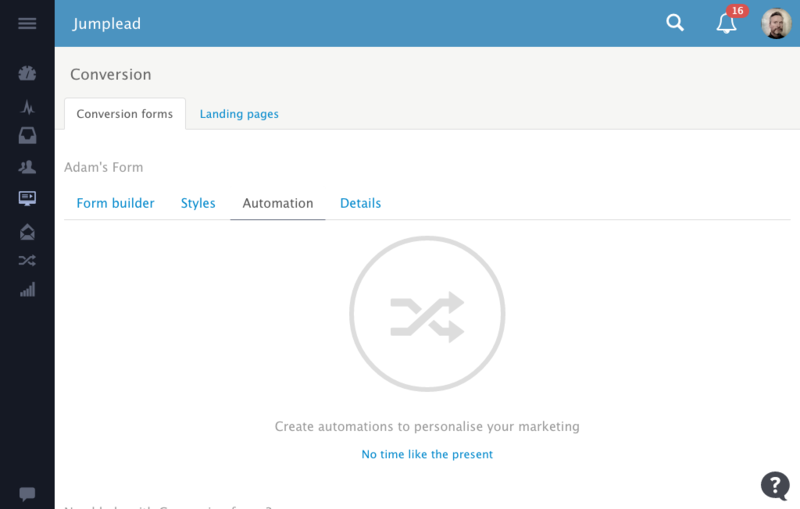 We've created a conversion form, added it to our website and triggered a marketing automation.